If you’re a vegetarian or vegan, you know just how tough it can be to find high-quality frozen meals that are nutritious and taste good. The selection is often slim, but one company that understands the demand is Tandoor Chef, which specializes in Indian entrees. In early 2011, the company rolled out a new line of products called Balanced Vegetarian, with meals meant to cater specifically to people following plant-based diets. Tandoor Chef’s VP of marketing, Mike Ryan, was kind enough to answer a few questions about the new entrees for us. LoveToKnow (LTK): Can you tell our readers a little about Tandoor Chef and why it might interest them? Mike Ryan (MR): First and foremost, manufacturing and providing restaurant-quality, healthy Indian food is Tandoor Chef’s number-one priority. Indian food by nature appeals to healthy eaters and those following specific diets. A wide range of Indian cuisine is vegetarian, vegan, and gluten-free . . . which is why we offer healthy cuisine in each of those categories. We’ve found that our vegetarian consumers buy Tandoor Chef not only because it’s vegetarian or vegan, but also because it’s restaurant-quality, all-natural, convenient cuisine. LTK: How are the new Balanced Vegetarian entrées different from Tandoor Chef’s other meatless products? MR: Balanced Vegetarian meals, which appear in a yin-yang style designed package emphasizing balance, have been created to provide vegetarian consumers with smarter and healthier at-home dining options. 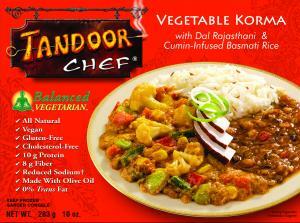 Balanced Vegetarian offers complete Indian meals with lower sodium [values], higher protein and fiber, and no trans fats. All five vegetarian varieties in Balanced Vegetarian are made with olive oil [and] satisfy several groups in the USDA food triangle. Select dishes are also vegan and gluten-free. Tandoor Chef’s Balanced Vegetarian product line offers a choice of five healthy Indian meals: Kofta Curry with Channa Masala and Spinach Basmati Pilaf, Mutter Paneer with Dal Palak and Cumin-Infused Basmati Rice, Palak Paneer with Dal Makhani and Turmeric-Infused Basmati Rice, Paneer Tikka Masala with Rajma Dal and Onion Basmati Rice, and Vegetable Korma with Dal Rajastani and Cumin-Infused Basmati Rice. LTK: Why did Tandoor Chef decide to roll out Balanced Vegetarian? MR: Vegetarian consumers make up a large percentage of both the Indian and American population, yet truly healthy vegetarian dining options remain limited, especially when it comes to eating at home. The American Dietetic Association reports that vegetarian and vegan diets are associated with reducing the risk of heart disease, colon and lung cancer, osteoporosis, diabetes, kidney disease, hypertension and obesity, among others. That’s why we’ve introduced Balanced Vegetarian, [as] a better-for-you initiative and an industry first. We’re proud to share this with the vegetarian community as a way of letting them know that we have their best health interests in mind. LTK: How does Tandoor Chef develop its recipes? MR: Tandoor Chef was founded by the Amin family in the 1970s. To this day, [we] develop recipes and products based off Mrs. Amin’s original cookbook. In addition to staying true to our roots, Tandoor Chef develops recipes in response to careful studies of industry trends and, more importantly, consumer feedback. LTK: Can you name some of the health benefits of the new entrées? MR: Aside from using olive oil and other all-natural ingredients and satisfying several groups in the USDA food triangle, each Balanced Vegetarian dish offers multiple nutrients that are particularly beneficial for those following a meatless diet, such as protein, grains, and essential vitamins B3 and B12. LTK: Could you describe paneer so people who have never had it can better understand what it’s like? 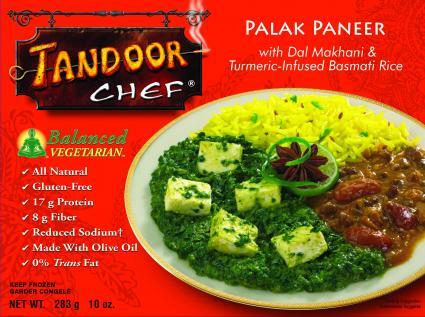 MR: Paneer is an authentic and exotic Indian cheese, rich and creamy in flavor. Tandoor Chef uses [it] in a multitude of dishes, including Palak Paneer (spinach and paneer), Palak Paneer Naan Pizza, and Palak Masala (paneer and a mild, creamy tomato sauce). Paneer is used in traditional Indian cuisine and can commonly be mistaken for tofu! LTK: What are some of the ingredients in the kofta (veggie balls in curry)? MR: Our Kofta Curry—vegetarian and vegan-friendly—is made with all-natural ingredients, including a blend of minced vegetables and authentic Indian spices. Tandoor Chef also offers a variety of innovative alternative dishes such as Vegetable Masala Burgers. These are obviously less formal than a meal, have an element of fun to them, and are relatively familiar, so there is generally less apprehension about investing in a “new” dish [when you try them]. Our Vegetable Masala Burgers are being very well received for their health attributes and unique flavor profile. In fact, they were recently voted [among] the best veggie burgers on the market by Real Simple magazine. Tandoor Chef’s meatless burgers are different from other frozen veggie burgers because of their potato pancake-like texture and exotic spices, including ginger, coriander, and mustard seed. LTK: Which Balanced Vegetarian entrées are suitable for vegans? MR: Tandoor Chef is seeing an increase in both sales and consumer interest when it comes to vegan dishes. In fact, there are at least 7.3 million Americans that follow a vegetarian-based diet, and 1 million of those polled are strictly vegan. Many popular Indian dishes are naturally vegan. Our vegan meals include Channa Masala, Dal Rajastani, Kofta Curry, Vegetable Masala Burgers, and Vegetable Pad Thai, as well as Balanced Vegetarian’s Kofta Curry with Channa Masala & Spinach Basmati Pilaf and Vegetable Korma with Dal Rajastani & Cumin-Infused Basmati Rice. Thanks, Mike! If you want to try Tandoor Chef’s new line of products for yourself, check out your local grocer’s freezer, or ask about Balanced Vegetarian entrees at a health food store near you.